For the past 24 years, London artist Zeus has been drawing inspiration from urban culture to create dynamic, experimental compositions that have re-defined graffiti art. Captivated by the hip-hop scene of the 80s, he began expressing his creative talents on the street when he was just 14, using walls, trains, and open spaces as his galleries. Since then Zeus has continually pushed the boundaries of graffiti artistry, taking the form out of its traditional setting and into new, exciting and more legitimate places. This is a Giclee print, screenprinted with a varnish, with additional gloss varnishes highlighting the coloured squares and the'streetopoly' text. Signed and numbered from an edition of 100. 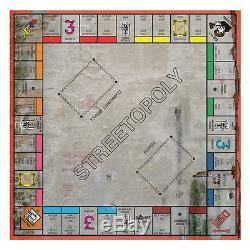 Any resemblance to popular property-speculation board games is entirely co-incidental! Visit our website for a huge selection of original works & prints by the likes of Banksy, Invader, Dran, BAST, Faile, David Shrigley and many many others. Or follow us on facebook / twitter / instagram... The item "Zeus Streetopoly Graffiti Kings Limited Edition Giclee Print Banksy/Dolk" is in sale since Friday, February 26, 2016. This item is in the category "Art\Art Prints".